Jon Wellinghoff, former Chairman of the Federal Energy Regulatory Commission and "Father of Demand Response": "You'll want to "stack" multiple demand response programs. If you're only in one program, you're missing out on many new programs. I'm aware of up to six programs being stacked at a single facility." Ed Sayers, Vice President of Energy at Simon Property Group: "Optimize your enrolled kW. DR works off of a simple formula: kW x $'s = earnings. Squeeze every kW you can by reevaluating your operational flexibility and enrollment levels. As you invest in energy controls or new equipment you'll often find that you can enable more kW, with quicker response times. That's more cash." Alex Laskey, founder and former President of Opower: "Take advantage of "out-of-market" demand response. You can double the value you get from curtailing loads. In nearly every North American power market, businesses incur peak demand charges. Moreover, transmission capacity charges are often greater than generation capacity expenses. You'll want to avoid these." Dana Guernsey, Vice President of Product and Energy Markets at Voltus: "Get back your backup generator. The opportunity to use your generator in demand response programs has returned. These resources are the highest quality power for your facility and a high quality type of demand response." Phil Giudice, former Commissioner of the Massachusetts Department of Energy Resources and CEO of Ambri: "Negotiate contract terms carefully. Look beyond simple top line revenue sharing percentages. Details matter and vary by program, market and geography. Some customers are surprised when it comes to unfamiliar terms such as "gross up." You can increase your earnings 10% to 30% per year by making sure you get a piece of all of the profitable opportunities available." Are you resolved to double your dollars in demand response in 2019? Email us for a detailed review of your portfolio (info@voltus.co - not .com) and we'll show you all the options to guarantee you hit that New Year's resolution. Recently I was in a meeting with four other women and it was embarrassingly notable. I've long ago stopped noticing when I am in a meeting with four men, so why should four women catch my attention? The answer of course is that this was a rare occurrence. 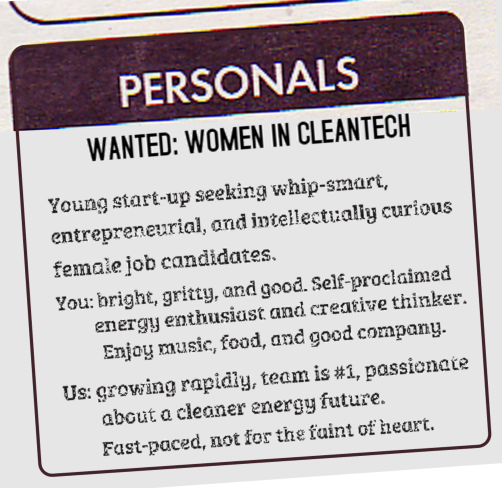 Ask any woman in cleantech and she'll tell you she's more often than not the only female in the room. I will admit that in the past I used do things like wear my glasses, put my hair back, wear a button-up shirt - essentially I was trying to blend in, so I wouldn't be perceived or judged in any way beyond my professional contributions. These were physical adjustments, rather than what I believe are more appropriate behavioral ones. Women should speak up more, say sorry less, demand what they want, and stop caveating. We need to fight the gender gap in cleantech, and encourage more women to enter, stay in, and become leaders in this amazing field. Ironically, the clean energy industry is one of the best opportunities to have a positive influence in the world. It impacts everyone, and getting it right makes our planet better. It is exciting, fun, and has a positive social impact . . . something that women rank very highly when considering their careers. Sadly, many still believe inherent biological reasons exist that make men better suited for STEM careers than women. Absurd . . . yes, but the argument boils down to this: if 30 applicants apply for a position and only 4 of them are female, odds are that the best candidate for the job is male . . . and doesn't every company just want to hire the best? What this is missing, however, is that the industry has a pipeline problem. The problem isn't that a company might select one of the 26 males as the best candidate for the position - the problem is that the company didn't do more up front on the issue that only 13% of their candidates in the pipeline were women to begin with. At Voltus, we know we need to proactively recruit female candidates . . . the male candidates come to us easily. This is because, not surprisingly, our professional networks represent the existing industry bias - sitting at just 23% female, so we need to actively manage against this in order to avoid perpetuating the problem. We have done dramatically more direct outreach to female candidates, recruited directly through university networks (which have closer to even ratios), and posted and networked within female-based industry groups. We've done a decent job of improving the number of female candidates we attract, but we need to do much, much better. We seek creative new ways to build out our pipeline of female candidates . . . this post itself is written to raise this issue and attract female candidates. Please share your stories, feedback, and advice with us, send this around to your female friends and colleagues, and come talk to us! Dana Guernsey - Vice President of Market and Business Operations, Voltus, Inc.
Did you once use your onsite generator to earn revenue through demand response? If the answer is yes, you'll want to join this webinar. As you likely know, in 2016 a US district court vacated language in EPA regulations that allowed onsite generation at commercial and industrial sites to participate in demand response programs under "emergency" operating conditions. It also had implications in Canada. The elimination of this language effectively removed 3,000 MWs of demand response from markets throughout the US and Canada. In this webinar, the leading demand response and generator experts will show you just how simple it can be to restart the cash flow from your generator at no cost and no risk in a simple, single-page DR agreement. Please join us by choosing one of the scheduled webinars below and we'll send you a special link with details. Thank you! You will receive details on how to join the webinar shortly. When $10 Million Shows Up in Your Bank Account . . .
Today, Voltus got a little pocket money (PR Newswire). It's creating quite a bit of buzz in the industry (Greentech Media) and we're grateful for the attention it's getting. The back story is pretty simple: a few of us put our nose to the grindstone for a year, built a great technology, signed up a bunch of customers, generated profits, and attracted the interest of investors who really liked the focused business model we developed to attack a huge, underpenetrated market where the competition wasn't innovating or fully serving customers. But what's the secret to our success and how do we plan to extend this success with $10 million in the bank? First, our success to date is simply a matter of attracting bright, gritty, and good people who are passionate about solving energy challenges. Second, our vision is simple: deliver more demand response dollars to the bottom line for our customers than anyone in the industry . . . less energy, more cash. Put the people and the vision together and get out of the way! This simple model has us doing three things: we build product, we sell product, and we deliver cash to customers. This aligns with how we differentiate: we have a best-in-class technology platform that unlocks every possible revenue stream for our customers, we have a transparent, no-cost, no-risk, single page commercial agreement that makes it easy for our customers to do business with us, and we are world leaders in understanding energy markets and demand response which allows us to more than double the value customers get from what they've been doing in the past. So, for our part, Matt and I sell. We evangelize. That's us at the Crowne Plaza in Springfield, Illinois last week in the midst of a Monday morning through Friday evening road trip. We crossed paths in Springfield, signed our funding documents, snapped a pic with the front desk attendant, and went our separate ways, Matt to Peoria, I to Champaign-Urbana. We'll sign up a dozen or so new customers from that trip. We're pretty sure that our competition's CEO and President don't do this. We're pretty sure they don't commit to delivering 100 MW individual sales quotas each year. Because selling is hard, yet it's the single most valuable thing a company does in a growing market. And Matt and I love to do it . . . we love to meet our customers . . . at their steel plants, their wastewater treatment plants, their grocery stores, their data centers . . . we love to see the pride they take in their work . . . we love to forge new friendships . . . we love to learn about their unique challenges . . . we love to tell the Voltus story . . . and we love to pay our customers to use our product to help them make their businesses stronger. Our team has a clear plan on how to turn that $10 million into $100 million in short order by delivering exceptional value to customers. You can be sure that Matt and I will be on the road doing our part to help our team get the cash to the customers. SPRINGFIELD, ILLINOIS, September 13, 2017 - Voltus, Inc., a leading provider of cash-generating energy products, announced today that it has been selected as one of only two winning suppliers of the Illinois Power Agency's Midcontinent Independent System Operator Zone 4 capacity procurement. Voltus’s commercial, institutional, and industrial demand response network now totals nearly 600 MWs in the MISO portion of Illinois and has helped the average C&I customer’s energy costs decrease by nearly $50,000 annually. The targeted 826 MWs of capacity procured in this process was for planning years 2018/2019 and the award to Voltus is the first time a demand response provider has won a contract in the Illinois Power Agency procurement process, which began in 2007. Additional details on the RFP results are found at: https://www.ipa-energyrfp.com/?wpfb_dl=1382. "Our C&I-focused demand response network in Illinois has delivered tremendous savings to customers, significantly reducing capacity prices that amount to 30% of a customer's annual energy bill," said Gregg Dixon, CEO of Voltus. “What we find most interesting is that the recent IPA procurement secured capacity at 10% of the cost of the well-known subsidies to two uneconomic nuclear plants that formed the basis for Illinois SB2814. In other words, the state didn’t need those subsidies in order to provide safe, reliable, affordable, and clean energy to its citizens." As a percentage of state electricity demand, and with the help of Voltus, Illinois now leads the nation in demand response MWs enabled to meet state-wide electricity supply needs while delivering among the nation's best power reliability and lowest capacity rates. As this resource grows rapidly in Illinois rate payers enjoy a 250% return on the dollars invested in demand response versus a traditional mix of supply, as evidenced by an Advanced Energy Economy report found at: http://info.aee.net/hubfs/PDF/aee-peak-demand-reduction-strategy.pdf?t=1446657847375. "Illinois legislators got it half right," said Matthew Plante, Voltus President. "While the subsidies offered to the nuclear industry through SB2814 were expensive and unnecessary, Illinois deserves credit for fully incorporating demand response into its resource mix. With all the talk about job creation, it’s amazing that a change as simple as encouraging more demand response can result in real job creation and a spark for Illinois economic growth. Voltus is excited about stimulating these kinds of direct benefits from our innovations in demand response and energy management." To learn more about Voltus, visit www.voltus.co or email info@voltus.co. Voltus represents the "potential of us" to better manage energy through simple, cost-free energy management products. Our commercial and industrial customers generate cash by allowing us to be their energy expert while we deliver innovative demand response, energy purchasing, and energy efficiency programs to them. It's this simple: a customer signs up with Voltus and every quarter we deliver dollars. Voltus makes money when our customers make money by sharing the cash generated from working together. What's more, there are significant community benefits that accompany working with Voltus - a cleaner, more reliable energy future and dollars invested back into your business and jobs instead of being wasted on a larger energy bill. We expect more than 3,000 commercial and industrial customers to join us for these webinars. Please join us by choosing one of the four scheduled webinars detailed below and we'll send you a special link with details. Thank you! We're excited you'll be joining. Voltus, Inc., the leading provider of demand response, energy procurement, and energy efficiency products to industrial, commercial, and institutional customers announced today that it has hired Neil Lakin and Michael de'Marsi to further build out its energy cloud platform, VoltApp™.